Collage, photo-manipulation and design are the technical features of Elena's approach that allow her to create uncommon and often surrealistic worlds perceived by a spectator intuitively, on the emotional level. It is a special space that looks rather like a dream filled with reflections and illusions. A space where many things are meant to be felt, not understood, where you come back again and again. Her passion for photography and collage creation began spontaneously back in childhood and became the self-expression possibility and necessity...as the way to say something that couldn't be said with words. Elena's works are sometimes compared with those of Dali and Magritte due to the complexity of artistic figures and a great number of of perception layers, though it is definitely an original artistic language and an absolutely unpredictable alternate reality. Do you know its face? Elena as an artist believes that an artist and spectators may and should see each artwork differently, applying their own experiences, states of minds and vocabularies. Thus, she doesn’t describe her artworks, but poses questions - and every person has their own answers and every artwork is personal to every spectator in her/his unique way. What inspires the worlds you create in your digital art? "Since my early childhood I wanted to escape reality due to its unbearability. My fantasy is quite good, so I started escaping to imagined worlds. I’ve been creating them in my mind as long as I remember myself and the world didn’t see yet a one hundredth of what I see. And it’s not an imagination that leads me to creating new worlds, but my suffering. To my regret I do that too often." Which (if any) of your imaginary spaces would you want to exist in real life? Why? "There is a lot of them, I don’t need to stay in any specific world and they are way too different, so I could choose between them. I have a grandma, she’s already 93, and for a long while she’s quite close to senility, but there is one thing that keeps her high energy and childishly happy – it’s travelling. She always needs to travel somewhere to be happy. And, in a similar way, I need constant changes in my senses and feelings, thus, I can’t stay in any single place even an imaginary one." What do you like about Loupe or how do you use Loupe? 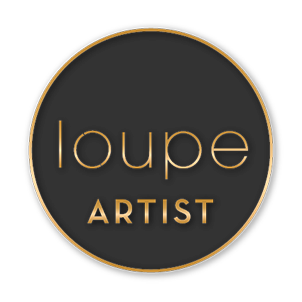 "Well, I like Loupe’s imaginative approach to art distribution. I like Loupe’s taste for artists and its founders’ and curators’ love to art and understanding that art is not ‘fun’, but necessity of a human soul. And I like that it’s led by ambitious fearless women. I watch it and I hope it’s gonna grow and surprise and connect more and more art and art lovers."